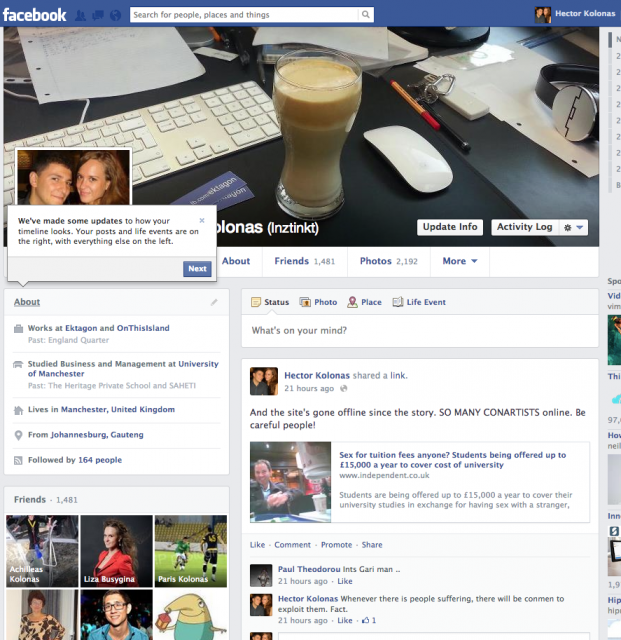 Having a look at the new Facebook Timeline layout, it’s growing on me, and this is why. I found the split-screen approach pretty confusing for perusing information and getting a great feel for the personality behind the timeline. The new layout is must more efficient in this aspect. Ahead of the new newsfeed design coming shortly, they’ve also put alot of effort into tidying up the layout of the timelines. Subtle title differentiation and blocked elements make navigation a breeze. I’ve also been given more ‘actions’ with regards to the information we would like to share. I can select which we’ve watched, want to watch, have read or even would like to read. Filling out even more information about who I am as an individual. With larger, full-width category blocks (friends, places, movies, books, likes, events, notes, etc.) and off-FB generated content (pinterest, quora, etc), I’m given the opportunity to display and share more and more about what makes me tick. Ofcourse there are also category specific privacy settings that let me control who gets to see what on my profile. So all in all, I really like the changes made. Some people will hate them though, and that’s unavoidable, but do feel free to sound off in the comments below.